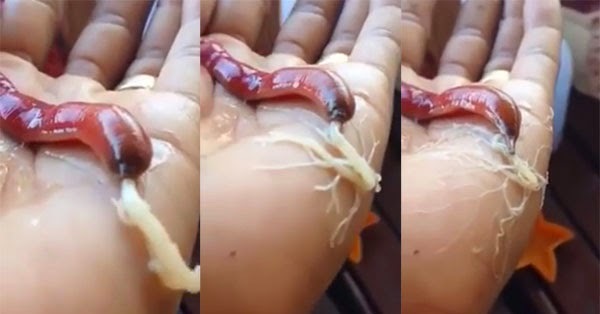 A viral video that captured a bizarre alien-like worm spitting out tentacles similar to Spiderman's webs has drawn curiosity among netizens. The nine-second clip, which was taken in Thailand, got over 4.8 million hits on YouTube since it was published by Manchester แมแน RUT last May 3. In the description, the uploader called the creature a nemertea. Also known as ribbon worm, this invertebrate animal uses its proboscis, an elongated tubular mouthpart from its head, for hunting, feeding and sucking. In the video, the ribbon worm can be seen spitting out a sticky, white mass that coiled the person's palm. The tentacles actually contain mucus with toxins that can paralyze a predator or prey. However, a separate report called it a peanut worm which became a subject of a recent scientific study said to have "unlocked the secrets behind the worm's superhero talent." Scientists in Chile used high-speed cameras to study the worm's cannons in action. They found out that pressure builds up as glue from a large reservoir behind the worm's head is forced through the narrow gun barrel. The pressure causes the pipe, which has no rigid supports, to jump about wildly like a high-pressure hose. Australian researchers saw a potential for use of the worm's glue in gels that could stick wounds together among other functions.